8. Wonderful, therefore, is the intellectual enjoyment that we gain from the study of the great poet, and no less the profit for the student making more perfect his artistic taste and more keen his zeal for virtue, as long as he keeps his mind free from prejudice and open to accept truth. Indeed, while there is no lack of great Catholic poets who combine the useful with the enjoyable, Dante has the singular merit that while he fascinates the reader with wonderful variety of pictures, with marvelously lifelike coloring, with supreme expression and thought, he draws him also to the love of Christian knowledge, and all know how he said openly that he composed his poem to bring to all "vital nourishment." In any praise of Dante, the poet, mention must necessarily also be made of his critical role in the consolidation of Italian as a literary language. In Dante's day, of course, Latin was still the universal European literary language. 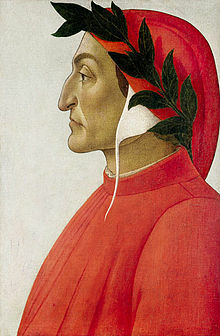 Dante likewise wrote in Latin - his famous political treatise, De Monarchia, for example, and also a treatise on the vulgar, or as we now call it, the vernacular language, De Vulgari Eloquentia. But he wrote his literary masterpiece in Italian. More precisely, he wrote it in the common dialect of his region, Tuscany. Then - and, to a significant extent, still now - Italy remains a nation more in name, a collection of regions, that share certain things in common, but still remain somehow incomplete as a political community. But one of the things that Italians all now do share in common is the literary language that Dante's Tuscan dialect became. As John Kleiner wrote in The New Yorker last month ("Dante Turns Seven Hundred and Fifty," May 20, 2015), referring to the italian astronaut reading Dane from outer space: "The fact that people in Venice and Palermo could understand Cristoforetti as she read from the Paradiso in space was due, in a quite literal sense, to the poem that she was reading." That alone might merit more than sufficient praise. That alone makes this anniversary (whatever its precise day) truly worth celebrating. With the end of the Easter season, the Paschal Candle and the icon of the Resurrection have been returned to the Baptistery, and the Resurrection's place has been taken by Andrei Rublev’s famous 15th-century icon of the Trinity. Sometimes referred to as “The Old Testament Trinity,” its theme is the familiar story in Genesis of the patriarch Abraham’s three angelic visitors, a visit subsequently interpreted in Christian tradition as an image of the three persons of the Trinity. In it, the second Person of the Trinity - the Son, the Word, who reveals God to the world - is portrayed prominently in the center, pointing out into the world. The Father is seated to one side, looking lovingly at the Son, who in turn looks lovingly at the Father, while the bright-robed Holy Spirit is seated on the other side. The three Persons gaze at each other in mutual loving communication, into which we in turn are also meant to be drawn by the Son. Well, you might say, that’s all very nice, but what of it? For so many (maybe most) of us, the Trinity has always seemed somewhat abstract – a doctrine duly believed in, of course, but not something otherwise given a lot of thought. But I say this in spite of the obvious fact that we were all baptized in the name of the Father, and the Son, and the Holy Spirit. On that occasion, we – or our parents and godparents - all made a profession of faith in the Father, and the Son, and the Holy Spirit. Our sins have been forgiven in the sacrament of Penance, in the name of the Father, and of the Son, and of the Holy Spirit. Those of us who are married – including those couples being honored at this Mass today - have exchanged wedding rings in the name of the Father, and of the Son, and of the Holy Spirit. The principal prayers of the Mass are mostly addressed to the Father, through the Son, in the unity of the Holy Spirit. And we have all, over and over again, been blessed in the name of the Father, and of the Son, and of the Holy Spirit. In short, our entire religious lives, both individually and collectively as a Church community, have been defined, formed, shaped by this awesome Trinitarian mystery of who God is, that defines God’s ongoing relationship with us and ours with God. In short, the doctrine of the Trinity is our uniquely Christian insight into who God is. As human beings, created in God’s image and likeness, we all have a built-in, natural, longing for God. That God exists is something we can experience naturally. But who God is - who God is in himself - is something we could never completely come to know on our own. That had to be revealed to us by God himself. And God has done so, revealing who he is in himself – one God in three distinct Persons: Father, Son, and Holy Spirit. We do not worship three gods, but one God – a unity of Persons in one divine nature or substance. Each of the three Persons, Father, Son, and Holy Spirit, is truly God, each distinctly God, but existing eternally in relationship to each other: the Father to the Son, the Son to the Father, the Holy Spirit to both. The very names Father, Son, Holy Spirit are relational names. By analogy, the titles “husband” and “wife” are names that are only understandable in terms of the relationships they signify. On the one hand, the doctrine of the Trinity expresses our uniquely Christian insight into the ultimately incomprehensible inner life of God – where the Son is the image of the Father, the Father’s likeness and outward expression, who perfectly reflects his Father, while the Holy Spirit in turn expresses and reveals the mutual love of Father and Son. At the same time, the Trinity also expresses something fundamental about how God acts outside himself, how he acts toward us. Who God is in himself is how God acts; and thus how God acts in human history reveals who God ultimately is. Already in the Old Testament, God was revealing himself – as Moses testified in today’s 1st reading [Deuteronomy 4:32-34, 39-40] - as one who repeatedly reveals himself in how he acts toward us. It is, of course, the Son, consubstantial with the Father, who for our salvation came down from heaven, and who, seated at the right hand of the Father, has sent the Holy Spirit upon his Church, making her the Body of Christ and the Temple of the Holy Spirit. Led by the Holy Spirit – as Saint Paul told the Christians in Rome and through them tells us [Romans 8:14-17] - we become true sons and daughters of God the Father and joint heirs with Christ. The Holy Spirit unites us with the Father in the Body of Christ, the Church. Through the sacraments, Christ continues to communicate the Holy Spirit to the members of his Church. Thus, at Mass the Church petitions the Father to send the Holy Spirit to sanctify the bread and wine that they may become the body and blood of Christ and that, filled with the same Holy Spirit, we who receive Christ’s body and blood may then be transformed into one body in Christ, participants in the mission of his Church. Homily for Trinity Sunday, Immaculate Conception Church, Knoxville, TN, May 31, 2015. Earlier this month the world remembered the 70th anniversary of V-E Day, the victory that marked the end of the Second World War in Europe. A few weeks earlier, we celebrated the sesquicentennial of the end of the American Civil War. My own generation grew up in the aftermath of World War II, the impact of which permeated that world in ways both good and bad. And we celebrate Mass today, a stone’s throw away from a Civil War cemetery, on a holiday that owes its origin to that terrible conflict. We celebrate this Mass today in a neighboring cemetery, one established on this sacred ground barely four years after the Civil War’s end – a cemetery established by Knoxville’s first Catholic community, committed and devoted to doing their Christian duty to all the dead of the parish. Cemeteries are special places for us – special not just because they are blessed and consecrated by the Church and marked by beautiful and noble monuments. They are special places for us, first and foremost, because it is where we remember one another, where we remember those who have died, who have gone before us in life, our cherished past to whom we owe our present. Remembering is one of the things that especially makes us human. To remember those who have died, as our nation does today and as we do whenever we visit a cemetery, is to acknowledge the importance of their lives - and the common humanity which we share with them in life and in death. Remembering is also one of the things that especially makes us Christian. To remember those who have gone before us in faith, as we do especially here today but every day at every Mass, is to celebrate the multitude of ways in which the grace of God touched and transformed each one of them in life - and the hope we still share with them in death. So it is good that we gather together today, to remember and pray for our brothers and sisters whose bodies lie here in this holy place. It is, as the author of the book of Maccabees has reminded us [2 Maccabees 12:43-46], a holy and wholesome thought to pray for the dead, that they may be purified from their sins and welcomed among the saints, as we too hope someday to be welcomed with them forever. Homily for Memorial Day at Calvary Cemetery, Knoxville, TN, May 25, 2015. Three weeks ago, we celebrated the confirmation of 8 of our young parishioners. Before conferring the sacrament, the celebrating Bishop (in this case, Cardinal Rigali) and the concelebrating priests extended their hands globally over those to be confirmed. This coming Saturday in Chattanooga, Bishop Stika will ordain one of our diocesan seminarians as a deacon The central act of that ordination rite is the ancient ritual of the “laying on of hands.” In total silence, the Bishop will lay his hands on the head of the one to be ordained. At the end of June, he will do it again, ordaining four deacons to be priests of the diocese of Knoxville. On that occasion, after the Bishop silently lays his hands on those to be ordained, the other priests present will then follow him and also lay their hands one by one on those to be ordained. This “laying on of hands” is an ancient gesture. We find it in the Acts of the Apostles, and in his letter to Timothy St. Paul refers to it – to having himself done it to Timothy. It also occurs in every Mass at the Eucharistic Prayer. It is a symbolic gesture which signifies the Church’s prayer for the Holy Spirit to come down upon those being confirmed or ordained or (at Mass) on the bread and wine to be consecrated. It is a very solemn and powerful gesture, the importance and significance of which is inherently evident, just from seeing it. That is how the presence and power of the Holy Spirit are ritualized in the Church’s sacraments. But at the very beginning of the Church, the presence and power of the Holy Spirit were even more dramatically on display, when suddenly there came from the sky a noise like a strong driving wind and there appeared to them tongues as of fire, which parted and came to rest on each one of them. And the 120 disciples gathered in that Jerusalem Upper Room were all filled with the Holy Spirit and began to speak in different tongues, as the Spirit enabled them to proclaim. Many people, if they think about the Holy Spirit at all, often picture him as some sort of bird. A strong driving wind and tongues of fire may be a bit more exciting, but may still seem somewhat elusive as an image of who the Holy Spirit is. God, of course, is, by definition, difficult to describe. Who the Holy Spirit is may be hard to pin down, but what he does is another story altogether. What he does at Pentecost is nothing less than to kick-start the mission of the Church by getting it out of that Upper Room! When Britain’s Queen Victoria, whose 196th birthday, by the way, is today, celebrated 60 years on the throne in 1897, she was too frail to walk down the long aisle of London’s St. Paul’s Cathedral. So the Thanksgiving Service was held outside. That prompted a scowling comment from the Grand Duchess Augusta Caroline of Mecklenburg-Strelitz, who complained about the Gospel being proclaimed out in the street – apparently forgetting (or ignoring) the fact that the street was where the Gospel had in fact first been proclaimed! Thus one of my favorite Easter hymns, Michael Ward’s In the Breaking of the Bread, recalls what happened that first Pentecost: they ran out into the street to tell them, Everyone that they could meet, to tell them. Indeed, it was just as Jesus himself had promised: When the Advocate comes whom I will send you from the Father, the Spirit of truth that proceeds from the Father, he will testify to me. And you also testify, because you have been with me from the beginning. So, filled with the Holy Spirit, the Church left that Upper Room, never to return. Instead they ran out into the street to tell them, Everyone that they could meet, to tell them. And just who was there to tell out in the street? In Jerusalem that Pentecost were devout Jews from every nation under heaven. So the second thing the Holy Spirit did at Pentecost was to break down barriers, beginning with the basic barrier of language. When the apostles spoke, each one heard them speaking in his own language. To those who knew their Bible, the meaning was clear. The Holy Spirit was undoing the evil of multiple languages in the world, the damaging inability of people to communicate that had come about as a result of human beings’ sinful attempt to construct a tower to get them to heaven on their own. Through the presence and power of the Holy Spirit, however, the Church undoes the disunity of the human race, reuniting it in something new, the kingdom of God. Artistic renditions of that first Pentecost frequently focus on the 12, typically depicted as grouped in a circle around Mary, the Mother of Jesus, and the Mother of the Church. In a famous mosaic in the Cathedral of San Marco in Venice, however, each of the 16 nationalities that are mentioned in the story is represented by a pair of figures, thus representing the universality of the Church. The point of the Pentecost story is not society’s diversity, which is just a human fact, but the Church’s unity and universality, which are among the accomplishments of the Holy Spirit. Both before and after the Tower of Babel, of course, the damage done by human sinfulness has taken many destructive forms. In his letter to the Galatians, St. Paul listed at least 15 of them. Too many Christians sometimes seem to have gotten into the habit of singling out this or that vice for special opprobrium – as if, for example, the only sins that matter were the sins against the 6th commandment, as if idolatry, sorcery, hatreds, rivalry, jealousy, fury, selfishness, dissensions, factions, envy, etc., weren’t just as important. Paul’s list is a long one, and we need to take it all to heart. Way back when, probably in Confirmation class, we were taught - and told to memorize – the fruits of the Holy Spirit. We cannot repeat them too often: love, joy, peace, patience, kindness, generosity, faithfulness, gentleness, and self-control. We need no more precise picture of who the Holy Spirit is, when we witness what he does, when we witness – and live – the fruit of the Spirit: love, joy, peace, patience, kindness, generosity, faithfulness, gentleness, and self-control. Homily for Pentecost Sunday, Immaculate Conception Church, Knoxville, TN, May 24, 2015. In the last pre-conciliar liturgical reform - reflected in the 1961 calendar and the 1962 "typical edition" of the Missal - the Vigil of Pentecost was still observed as a liturgical day of highest rank (and a fast day), and it still retained its ancient vigil Mass, although without the ancient vigil service itself, which had been abolished in the 1955 reform of Holy Week. Apparently, ancient Roman practice permitted baptisms at Pentecost as it did on Easter (perhaps as a make-up date for those who weren't ready or for whatever reason missed getting baptized at Easter?) A Pentecost Vigil thus developed that closely paralleled that for Easter (minus the blessing of the new fire, etc.) Like the pre-1970 Easter Vigil, this Pentecost Vigil was celebrated in penitential purple. It began with a set of six "prophecies" - repeated from among the Easter Vigil's 12 - followed by the blessing (again) of the baptismal water and font (on this occasion re-lighting and re-immersing the Paschal Candle that had been extinguished on Ascension). Then, after the Litany, came the festive Mass (in red vestments) which exhibited some of the same liturgical peculiarities that the Easter Vigil Mass did. Unlike on Holy Saturday, however, other Masses were also permitted that day, with the addition of a proper Introit but otherwise with the textual peculiarities of the solemn Vigil Mass. The Mass (minus the Paschal Candle but retaining its other Easter-like features) survived the 1955 abolition of the prophecies, font blessing, and litany, thus rendering it into a real historical curiosity. Given the disappearance of Pentecost baptisms and the antipathy of the liturgical reformers to penitential practices in general and vigils in particular, its eventual demise in the Paul VI rite really should probably have come as no surprise. Still, it obviously possessed some residual appeal - reflected in the preservation in the new Missal of not just a separate Saturday evening Mass but of an alternative longer form for it which, like the older Pentecost Vigil, again mimics that of Easter. My guess would that that longer form is seldom celebrated in parishes. The whole psychology of the Saturday evening "anticipated" Mass - let's get Sunday over with as early and quickly as possible - militates against seriously reviving vigils. Still, the attempt is commendable and (given the constraints imposed by the current model of a vigil as essentially just a longer than usual Mass) not badly done. So, after introductory didactic lecture that has become customary on such occasions, four readings are proposed (following the standard reading-response-prayer format). The readings are well chosen selections that relate to Pentecost - Genesis on the tower of Babel, Exodus on God's appearance at Mount Sinai seven weeks after the first Passover, Ezekiel on God's Spirit animating the dry bones, and Joel on the outpouring of the Spirit - actually a more fitting set of selections in my opinion than some of those proposed at the Easter Vigil. The Christian Pentecost is to Easter what the Jewish Pentecost (Shavuot) is to Passover. The old post-Pentecost Ember Days included Old Testament readings from Leviticus and Deuteronomy that recalled that connection. But, with the demise of the Ember Days, where is that remembrance to be found in the liturgy? Likewise, I'd personally like to see something from the Book Ruth, which is read on Shavuot (because its central event takes place - like Shavuot - at the time of the wheat harvest and also because of the belief that King David, Ruth's grandson, died at Shavuot). Perhaps such linkages are now too arcane for a post-modern mentality. But Ruth is a beautiful book on several levels and definitely deserves more attention than the liturgical cycle gives it. Perhaps in Advent? Pentecost connection with Shavuot is especially relevant this year when they occur on exactly the same day. This Saturday night, observant jews all over the world will be keeping an all-night vigil. How fitting it would be if we were doing the same! Anyway, alone among all the many suppressed vigils, the Vigil of Pentecost survives slightly and in some still recognizable form. The challenge is to find a viable context for using it that could be perceived by people as beneficial rather than just being burdensome. The past few weeks, I have been enjoying watching Father Brown on PBS - a British television drama which began airing on BBC in January 2013. It is based on the original Father Brown character, created originally by G. K. Chesterton. Some of the early episodes are supposed to be loosely based on some of Chesterton's actual stories, but many of the stories seem to have been newly composed for this series. It is set during the early 1950s, in a fictional Cotswold village, where Father Brown is the parish priest at St Mary's Catholic Church, while solving crimes on the side. Father Brown’s vocation as a priest affords him a unique perspective on human nature and insight into human behavior. Many of the original Father Brown short stories were required reading in my high school in the early 1960s. I can remember reading them and maybe an odd scene or two, but for the most part I don't remember and so probably wouldn't really recognize the stories themselves, although I certainly do remember the character Chesterton created and can readily recognize him in the new series. The new series seems to be trying to be faithful to what was so distinctive about Chesterton's Father Brown - the unique way in which his priesthood equips him to be such a good detective. It is always nice to see television that portrays religion in such a positive light. According to something I saw somewhere, the contemporary series was set in the 1950s in order to allow Father Brown to solve crimes using his knowledge of human nature and insight into human behavior in a period prior to our contemporary crime-solving technology. The Chesterton character clearly wouldn't work as well in a world in which criminal investigations are heavily scientific and technological. his distinctive skills would either be redundant, or else their superiority would discredit contemporary science and technology. Personally, I rather like the 1950s ambience. It nicely evokes a simpler time - not just in terms of crime-solving technology, but in human and social relations. And a priest detective certainly seems much more credible in that era than would be the case today. But I wish they had been more completely consistent about the 1950s setting. Father Brown is sometimes heard to use the plural possessive (their) to refer to a singular antecedent, when an authentically 1950s speaker would likely have used the masculine singular (his). And, whether due to ignorance or inattention, Father Brown's liturgical vestments - for example, the ugly white chasuble he wore in the first episode and the purple funeral vestments he wore in the second - look much too contemporary (as, even more inappropriately, is the use of purple instead of black for a funeral Mass in the second episode). Nor is it very likely that a real Lady Felicia would have sung Amazing Grace at a Catholic Mass in the 1950s. These are, I suppose, somewhat minor quibbles that do not radically undermine the drama, but they do detract from the 1950s ambience, contaminating it with an out-of-place contemporary sensibility. That said, Father Brown is quality drama, evokes chesterton's original character well enough, and is good fun. The solemn Beatification in El Salvador on Saturday of the martyr Oscar Romero (1917-1980) will be yet another instance of the centrality of Latin America in the contemporary Church, hastened undoubtedly by the election of a Pope from Latin America. Latin America's transition from being on the periphery to being more at the center of the Church, itself mirrors the transition that took place in Latin America - and that Latin America has especially exemplified for the Universal Church - in the wake of the decisive meeting of Latin American bishops at Medellin, colombia, in 1968. It was at Medellin, in the presence of Blessed Paul VI, that the bishops famously adopted the phrase "option for the poor" - signifying a new stance on the part of the hierarchy, then widely perceived as part of the Latin American political establishment. Trained as a child to be a carpenter, Romero entered minor seminary at 13 and eventually received an STL from the Gregorian University in Rome, where he was ordained a priest on April 4, 1942 - during the Second World War. Returning home in 1943, he was interned in Cuba for having travelled to an enemy state (Italy), but was able to return eventually to El Salvador after several months imprisonment in Cuba. Back in El Salvador, he served as a parish priest and eventually as a seminary rector and secretary to the National Bishops' Conference. Ordained a Bishop in 1974, he was appointed Archbishop of San Salvador in 1977, At that time, he was seen as a basically conservative spiritual leader who would not rock the political boat in an increasingly polarized society - a society where some priests were openly siding with the poor and were even perceived as Marxists. Shortly after his appointment, however, the political assassination of one such progressive Jesuit priest, Rutilio Grande, who was also Romero's personal friend, deeply affected and helped to radicalize him. He later said: "When I looked at Rutilio lying there dead I thought, 'If they have killed him for doing what he did, then I too have to walk the same path'." As with so many issues, it is often one's personal experience of actually knowing people who are personally affected by a situation that motivates movement on an issue. After the military junta came to power in 1979, Romero criticized United States' President Jimmy Carter for giving the government military aid. His heightened political profile got him an honorary degree from Louvain (now Leuven) in Belgium. In his acceptance speech there on February 2, 1980, he said: “That part of the church has been attacked and persecuted that put itself on the side of the people and went to the people's defense. Here again we find the same key to understanding the persecution of the church: the poor.” Back home again, he was famously assassinated while celebrating Mass on the evening of March 24, 1980. Three years later, during his first visit to El Salvador, Pope Saint John Paul II prayed at Romero's tomb and praised Romero as a "zealous and venerated pastor who tried to stop violence." Finally, the Congregation of the Causes of Saints voted recently to recognize Romero as a martyr, thus clearing the way for immediate beatification. The Congregation recognized that his murder "was not caused by motives that were simply political, but by hatred for a faith that, imbued with charity, would not be silent in the face of the injustices that relentlessly and cruelly slaughtered the poor and their defenders." In his own life and ministry, Romero personified the process of - as Pope Francis likes to say - going out to the peripheries. By is beatification, the Church itself further embraces that process for the Church Universal. In his column in Sunday's New York Times, Ross Douthat provocatively asked "Do Churches Fail the Poor?" The column can be accessed online at: http://www.nytimes.com/2015/05/17/opinion/sunday/ross-douthat-do-churches-fail-the-poor.html. At first sight, Douthat's question seems strange, to say the least. All but the most implacably ideological enemies of religion recognize that Churches and religious institutions (schools, hospitals, and other charitable institutions) devote enormous resources to direct and indirect service to the poor, not to mention an army of religious volunteers engaged in direct service to the poor in their communities all over the country. Douthat does not deny that, of course. In fact, he affirms it in response to the allegation that Churches and religious institutions are disproportionately focused on issues of sexual morality (the so-called "culture wars") rather than on issues connected with poverty. President Obama himself, at last week's panel discussion at Georgetown (about which I wrote yesterday) also gave voice to this problematic notion - an idea that Douthat adamantly calls "ridiculous." Indeed, he goes so far as to say that "the belief that organized religion is organized around culture war is largely a conceit of the irreligious." That said, however, he does admit that some religious leaders and organizations may have seemed to emphasize those "culture war" issues rather than poverty in terms of their political priorities. That this has sometimes seemed so can hardly be denied. Responding to Douthat in regard to the Catholic Church in the United States, Michael Sean Winters, at National Catholic Reporter, expressed the view that "most bishops do spend more time working on behalf of the poor than on any other issue with public policy significance. but it is also the case that in the political arena the United States Conference of Catholic Bishops has, as an organization, directed its focus more and more to the culture war issues and further and further away from fighting on behalf of the poor and the working class." (See http://ncronline.org/blogs/distinctly-catholic/douthat-poverty-partisanship). Personally, I wonder how much the differences in perception reflect different audiences. I think most regular churchgoers would say that they seldom hear overtly political preaching. On the other hand, non-churchgoers may form their impressions about what Churches care about mainly from secular media, which overall generally seem more interested in covering "culture-war" religious activities more than other religious activities. This specific question of differing perceptions - reflecting in turn one's actual level of connection with and involvement in Churches and religious institutions - would seem, in my opinion, to warrant a lot more examination! But Douthat makes another, much more important point about how Churhes and religious institutions may be failing the poor, a point which I fear can very easily get lost due to the persistent preoccupation with how much Churches do or don't emphasize "culture-war" issues. And that has to do with already well noted decline of religious affiliation and practice among those at the bottom of the socio-economic pyramid. According to Douthat, "actual religious practice has collapsed more quickly among Americans with weaker economic prospects than it has among the college-educated upper class." From a religious perspective, Douthat describes this as "a signal failure: A church that pays out to help the poor, but doesn't pray with them, looks less like a church than what Pope Francis has described, unfavorably, as merely another N.G.O." From a secular perspective, Douthat echoing Putnam, reminds us that "the social benefits of religion are stronger further down the socioeconomic ladder, and these benefits are delivered through community, practice, and belonging." Essentially, this somewhat parallels the now much noted "marriage gap." Broadly speaking and putting it into Putnam's language, we may be talking about a "social capital gap" - of which religious affiliation and participation is one more symptom, consequence, and contributing cause. The poor may be always with us, but political attentiveness to the problems of poverty is quite another story. Last week, Georgetown University held a bipartisan, Catholic-Evangelical conference on overcoming poverty in the United States. It probably would have gotten very little media attention at all, were it not for the participation of the President of the United States. And, even then, it has received far less attention than the topic deserves. Nor should that surprise anyone. The persistence of the problem and its complexity get in the way of easy solutions - automatically a problem in our attention-deficit society. Nor is poverty a priority for either side in our currently polarized politics. The Right, after all, is focused on further enriching the already overly rich. The Left is likewise preoccupied with elte concerns, notably the intense pursuit of identity politics and abortion. Neither party is particularly focused on the multitudes their respective elites have left behind. The President participated in a panel discussion with Catholic political pundit and columnist E.J. dionne, political scientist Robert Putnam, author of Bowling Alone: The Collapse and Revival of American Community (1995) and more recently Our Kids: the American Dream in Crisis, and economist Arthur C. Brooks of the American Enterprise institute. Personally, I am a great fan of Robert Putnam's work - both Bowling Alone and his more recent Our kids , which I think anyone interested in the moral and cultural component of contemporary American inequality should be reading. But it is the President's remarks (which I finally found time to read over the weekend) which I want to reflect on today. As E.J. Dionne pointed out to the President right away, Presidents don't usually do panels. Indeed, commenting on the event the next day in The New Yorker, Paul Elie wrote: "In our anti-monarchy, it was a sight beautiful to behold—the leader of the free world ambling onstage and settling into a chair just like the chairs occupied by his fellow-interlocutors, Robert Putnam, of Harvard, Arthur Brooks, of the American Enterprise Institute, and E. J. Dionne, of the Washington Post, and speaking about poverty and listening to the others while the bells of the university chapel chimed noonday in the background." Of course, the reality is that the modern presidency is in fact extremely monarchical, both in substantive power and in its style, which is what made the President's participation in this panel seem so unusual! But, anyway, back to the President's comments! Apart from the sheer impact of his presence and participation, I think the President's most important contribution was simply to highlight the need to get our of our ideological boxes a bit. Thus, he expressed his view "that we are at a moment - ... in part because of a growing awareness of inequality in our society - where it may be possible not only to refocus attention on the issue of poverty, but also maybe to bridge some of the gaps that have existed and the ideological divides that have prevented us from making progress." And what are those? In the President's words, "we have been stuck, I think for a long time, in a debate that creates a couple of straw men. the stereotype is that you've got folks on the left who just want to pour more money into social programs, and don't care anything about culture or parenting or family structures, and that's one stereotype. And then you've got cold-hearted, free market, capitalist types who are reading Ayn Rand and - (laughter) - think everybody are moochers. And I think the truth is more complicated" basically, the President's not so surprising point is "that if coming out of this conversation we can have a both/and conversation rather than either/or conversation, then we'll be making some progress." He's right, of course. He was also right to point out that some of this reflects the growing cultural and class segregation in our society. I've often used the example of my father and his boss. His boss was certainly wealthier and lived in a better neighborhood, etc., than his employees, but he likely looked at the world not all differently from his employees. They had lived through Depression and War, watched the same movies and listened to the same news, and shared more or less similar values. That's the way it was when I was growing up, and that is largely the world Putnam evokes. It is, as the President pointed out, "the first thing that strike you" when reading Our Kids. The change from then to now, the breakdown of a shared common community, is key - both economically and morally - to understanding today's crisis - both economic and moral. "Part of what's happened," the President noted, "is that elites in a very mobile, globalized world are able to live together, away from folks who are not as wealthy, and so they feel less of a commitment to making those investments." So, "what used to be racial segregation now mirrors itself in class segregation and this great sorting that's taking place." It was in this context that he made his comment about the media, which apparently hit a nerve over at Fox News, about media efforts to make people "be mad at folks at the bottom ... the effort to suggest that the poor are sponges, leaches, don't want to work, are lazy, are undeserving ..."
Near the end, when Putnam referenced getting "congregations and parishes all across this country" to focus on reducing "the opportunity gap," that gave Dionne an opportunity to bring up religion - recalling how the President's early-career community-organizing work "as actually paid for by a group of Catholic churches." 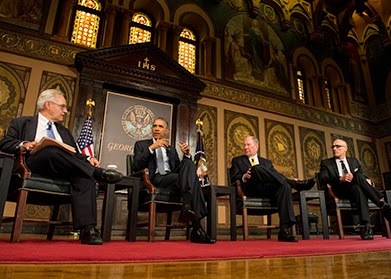 This gave President Obama the opportunity not only to recall how his "first job was funded through the Campaign for Human Development," but also to affirm that "faith-based groups" understand these issues well - in part because "they're embedded in communities and they're making a difference in all kinds of ways." Commendably, the President encouraged faith-based groups in their activity and encouraged them "to speak out." Here, however, he felt the need to allude to the proverbial elephant in the room: "these are areas where I agree with the evangelical community and faith-based groups, and then there are issues where we have had disagreements around reproductive issues ...."
But, of course, this Administration has pursued more than mere "disagreements." It has pursued (with rather limited success, so far) a radical strategy of trying to coerce religious institutions to cooperate in its moral and cultural agenda, most famously in the case of the HHS contraception mandate. And it has effectively sought to exclude religious institutions from providing the social services they are so good at, if they don't get on board with anthat agenda of reinventing society along severely secular moral and cultural lines. What this reflects, of course, is what I referred to earlier - the primacy on the political and cultural left of a certain elite outlook on certain social and moral matters that apparently takes precedence over old-fashioned concerns about poverty and inequality that used to define the political and cultural left. The President's participation in that panel proved what a powerful advocate he can be for overcoming "the opportunity gap" in our society. But issues raised at the end also illustrate one of the major obstacles in the way of mobilizing religion to effect a more unified society. In The Last Word (Harper Collins, 2005), the prominent British biblical scholar N.T. Wright (the Church of England’s retired Bishop of Durham) suggested that we think of history as a play in 5 acts. The 1st act is creation. The 2nd is the fall and sin’s consequences for the human family. The 3rd is the story of God’s Chosen People from Abraham to Jesus. The 4th is the story of Jesus, the fulfillment of God’s revelation to Israel (after whom, as Vatican II reminded us, we neither need nor expect any further revelation). That then is the foundation for our current 5th act – the present, the time of the Church, which presupposes all that preceded it, while moving forward toward out final destiny. Historically speaking, this 5th act – the time of the Church, our time – began when the disciples were all filled with the Holy Spirit at Pentecost. Before his ascension, the Risen Lord had told them to remain in Jerusalem to await the promised gift of the Holy Spirit. The Acts of the Apostles tells us they were some 120 disciples, together with Mary and the apostles, who prayed together during that interval, that in-between transitional time, which the Church’s calendar traditionally recalls during this novena of 9 days between Ascension Thursday and Pentecost Sunday. That traditional novena is somewhat abridged in much of the United States where the Solemnity of the Ascension is transferred to this Sunday. So, instead of celebrating the Ascension this past Thursday, much of the United States celebrated Saint Matthias instead. It was just coincidence, of course, that it was May 14, Saint Matthias' feast in the current calendar. Still, there could hardly be a more fitting saint to focus on this week. I like to think of Matthias as the patron saint of substitutes, for according to the account in Acts (the only actual mention of him in the New Testament) he was chosen by the post-Ascension, pre-Pentecost community to restore the apostolic college to its full complement of 12, replacing the betrayer Judas. Ironically, however, if instead we had celebrated the Ascension on its actual day last Thursday, while that would have meant missing Saint Matthias' feast this year, we would in fact be hearing the same account in Acts 1 of the selection of Matthias at Mass today (designated in the universal calendar as the 7th Sunday of Easter). Apparently, one of the tasks that principally preoccupied the community during those transitional days was filling that vacancy that had been created among the 12 by the defection of Judas. Just as the nation of Israel traced itself back to the 12 sons of Jacob, likewise the Church would forever after trace itself back to the 12 official witnesses of Jesus' life, death, and resurrection. Hence, the unique job description Peter proposed: it is necessary that one of the men who accompanied us the whole time the Lord Jesus came and went among us … become with us a witness to his resurrection. The 12 would in time be succeeded collectively by the Bishops of the Church, who are our link back to the witness of the apostles. Bishops preach the word, celebrate the sacraments, and individually govern particular local Churches while collectively collaborating with Peter’s successor in governing the universal Church – thus relating the local Church to the universal Church and the universal to the local, while linking us back in time to that original Jerusalem Church. This collective foundational function of the 12 was unique to the beginning of the Church. So, except for Peter, the designated leader of the 12, there would not be individual successors to individual apostles. After Peter, as the recognized leader of the 12, had taken the initiative in this matter and established the criteria for Matthias' selection, the whole community then proposed the candidates. Unlike contemporary politicians, they didn’t propose themselves. Then as now, it was the Church which authoritatively called individuals to ministry. Now as then, individuals don’t appoint themselves. Guided by God’s grace in their lives, individuals do indeed offer themselves for service to the Church; but their calling needs to be tested affirmed by the institutional discernment of the Church community. And the whole community's role in this is important. Just as it was the whole community that nominated Matthias, so today every local Church community, every parish congregation, needs to be alert to identify the many Matthiases that may be among us and to encourage them to respond to both the inner promptings of divine grace and to the external promptings of others. Today is the 40th day after Easter, the traditional date for celebrating the Ascension of the Lord. In some countries, Ascension Thursday is still a legal holiday. In New York City, it is not quite a legal holiday; but, because of Ascension, there is no "Alternate Side of the Street Parking," which is almost as good as being a holiday! In much of the United States, however, the Ascension is transferred to the 7th Sunday of Easter – next Sunday, May 17. Liturgically, the Ascension has traditionally been celebrated as one of the 5 greatest annual solemnities - along with Christmas, Epiphany, Easter, and Pentecost. Until 1955, it had a full octave. And in some pre-Tridentine medieval rites, its Mass had a glorious sequence, Omnes Gentes Plaudite. In any case, the Ascension is less about Christ’s departure than about where he is now. Theologically, Ascension Day celebrates the fact that the Risen Christ is now (as we sing every Sunday in the Creed) “seated at the right hand of the Father,” where he lives forever to make intercession for us (Hebrews 7:25). This solemnity directs our attention to Christ, who ascended into heaven before the eyes of his disciples, who now is seated at the right hand of the Father, invested with royal power, who is there to prepare a place for us in the kingdom of heaven, and who is destined to come again at the end of time. [Ceremonial of Bishops, 375]. The traditional Catholic devotion of the 9-day novena of prayer has its foundation in this formative experience of the early Church. As the Church’s original novena, the 9-day period between Ascension Thursday and Pentecost Sunday, is particularly focused on highlighting the presence and action of the Holy Spirit, who inspires and empowers Christ’s mystical body, the Church, for its mission in the world. During this period of preparation for Pentecost, it like to recall some words, preached on Pentecost Sunday 1902, by one of Servant of God Isaac Hecker’s companions in the founding of the Paulist Fathers and himself the Paulists’ 3rd Superior General, Fr. George Deshon, CSP, (1823-1903): The Holy Ghost is the life of the Church, and he is also the life of each one of us, if we will only let him be, if we will only submit to let him rule and teach us. He sits in our souls as the Lord in his own temple, and if we would only quiet ourselves and still the noise and turbulence of petty, temporal, perishing things, and affairs which occupy us and take up our whole attention, he would speak to us and teach us how to practice all virtue and keep out of all difficulties, and to be great friends with God and great saints, and secure peace in this world and our salvation hereafter. In the wake of last week's parliamentary election in the United Kingdom, a friend sent me an article by Dominic Lawson in the Daily Mail defending the traditional British (and American) "First-Past-the-Post" system (traditionally abbreviated FPTP) against the continental alternative of "Proportional Representation" (PR), most recently advocated by Nigel Farage of the United Kingdom Independence Party (UKIP). There is a lot to be said for FPTP. When I was a political scientist, I was taught - and then went on to teach others - that our British and American FPTP system was a major factor in producing a stable 2-party system, then widely admired as one of the virtues of our system as opposed to the messier multi-party systems found on the continent. I agreed with that view then and can still appreciate it. But things have changed - for the worse - on both sides of the pond. In Britain, the kind of national consensus that accompanied the dominance of its 2 parties in much of the 20th century has evaporated. for better or for worse, British voters are much less attracted to the two 20th-century parties and much more attracted to splinter parties of a sectarian ideological type (e.g., the Green Party) or of a nationalistic sort (e.g., The Scottish National Party and UKIP). FPTP always distorts the popular will. In the past, for example, the fact that Scotland is overrepresented in the House of Common compared to its proportion of the population not only gave Scotland a bigger voice in the Commons that its population deserved but also unduly advantaged the Labour party (not enough to guarantee victory but enough to keep it competitive). In this changed environment, however, in which the consensus that the two 20th-century parties ought to govern has begun to break down, FPTP's radical distortion of the popular will is much more problematic. Likewise in the United States, where we no longer have two broadly based, nationally competitive parties but instead two, narrowly ideological, sectional parties the distorting effect of FPTP is much more pernicious than it used to be. Just consider the fact that, if the US had some sort of proportional representation instead of FPTP, the Republicans would not control the House of Representatives, since in fact more votes were cast in the congressional elections in favor of Democrats than in favor of Republicans, who can only win because of the vagaries of FPTP. When it comes to electoral arrangements I tend to be quite conservative. I adhere to the Chestertonian adage that if it is not necessary to change then it is necessary not to change. Electoral arrangements are part of a nation's political culture and should not be altered except for serious reasons. And we all know from experience of the danger of unintended consequences that come about when electoral arrangements are altered. Still, there have been times when such alterations have been beneficial - the most obvious being the extension of the suffrage to previously excluded groups and the direct election of US Senators. Perhaps it is time to consider rethinking FPTP and moving to some more proportional system that better represents a more divided and polarized society. Of course, that division and polarization that have been enhanced by FPTP and have rendered Washington so dysfunctional, also practically guarantee that no serious democratization of our electoral arrangements is likely any time soon. But that only highlights the fact that in today's changed political culture (on both sides of the pond) a system such as FPTP in which every vote does not really count - and many votes may end up not really counting - may diminish rather than enhance the perception of political legitimacy. In the old calendar, today would have been Rogation Monday - the first of three consecutive days before the Ascension when a quasi-penitential procession was traditionally held while the Litany of the Saints was sung. Although I am old enough to have been around to experience such things, and I can remember "Rogation Days" on the wall calendar and in my Missal, I never actually experienced their celebration at all. They just weren't part of ordinary, mid-20th-century, American, urban parish life. Perhaps they were still observed in more rural areas, but I really don't know. Never having had any actual experience of Rogation Days made me mildly indifferent to their post-1969 elimination from the Church's calendar. In retrospect however, I am fairly convinced that their elimination may not have been such a smart idea, after all. Like the seasonal Ember Days, the Rogation Days highlighted how the switch from paganism to Christianity did not change pre-modern people's consciousness of their dependence on nature or their need for a successful harvest or the value of ritualizing those needs on traditional days. In light of our own modern alienation from the natural world and the environmental catastrophe this has caused, it might make some sense for us to reacquaint ourselves with those ancient rituals of neediness and dependence that remain at the heart of our human experience in a world which is in its own way just as threatening and challenging as was that of our ancestors. Unlike the "Greater Litanies," formerly celebrated on April 25, which were unambiguously of ancient Roman origin, the "Lesser Litanies" before the Ascension were Gallican in origin, supposedly introduced by Mamertus of Vienne at a particularly catastrophic time around A.D. 450. Thus, along with the seasonal aspect, these Rogation Days highlight the sense of struggle against danger (which even in more peaceful periods is always an inevitable dimension of Christian life). The centerpiece of the Rogation Days was, of course, the procession during which the Litany of the Saints was sung. Speaking personally, I love litanies, because they are such a great vehicle for large congregations can participate actively and fully in communal prayer without needing either advance preparation or individual texts (since only the leader needs the text.) I especially like the Litany of Saints because of its antiquity and complexity, its multiple invocations that highlight our dependency and neediness, and its dramatic role in some of our more spectacular ceremonies such as ordinations. Nowadays, when ordinations are no longer associated with Ember Days and have largely lost any vestige of their traditionally quasi-penitential character, the litany may be the last link with that ancient tradition and ancient sensibility. Just last week, at http://liturgicalnotes.blogspot.co.uk/2015/05/a-plea-for-litanies.html, the always interesting Fr. Hunwicke called the Litany of the Saints "the great, majestic, formal supplication of the Western Church. Especially in times of trial." It might seem like pointlessly nostalgic liturgical romanticism to recommend rogation-day processions in our urbanized, industrialized world but there is nothing nostalgic or romantic about the neediness and dependence that motivated them and that are reflected and expressed in the rogations rituals and the petitions of the litany. If I were involved in preparing the Holy Father's forthcoming climate encyclical, I'd probably put in a good word for recovering observances like rogation and ember days as part of a much needed spiritual retrieval of a more balanced relationship with the natural world and a more humble acknowledgment of neediness and dependence on God, on one another in society, and on the earth itself.